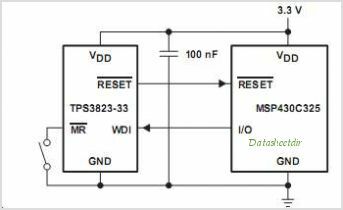 The TPS382x family of supervisors provides circuit initialization and Timing supervision, primarily for DSP and processor-based systems. This is one package pinout of TPS3828-33,If you need more pinouts please download TPS3828-33's pdf datasheet. This is one application circuit of TPS3828-33,If you need more circuits,please download TPS3828-33's pdf datasheet.